The colonia is named after the beautiful Amapas or Primavera tree, which in the spring blooms with pink flowers. It grows natively on the hillsides of the lush tropical colonia. Prior to the 1960s, Puerto Vallarta was only developed north of the Rio Cuale, and access to points south was by crossing the river. A bridge was installed in the 60s, and the new neighborhood of Emilana Zapata grew up. As the town expanded south, Calle Amapas (beginning at Calle Rodolfo Gomez) became a real street, with oceanfront condos and hotel sprouting up through the 1980s in the Los Muertos Beach area, which continued to develop through the 1990s to become urbanized, and a very popular tourist destination. Major hotels such as the Tropicana, Blue Chairs and Meza del Mar anchored the area, while large condo buildings such as Playa Bonita, La Palapa, El Dorado and others lined the oceanfront. The Amapas hills were largely undeveloped until the 1970s when Villa Tizoc was built near the Los Pinos area. It was the first multiunit condo building south of town. A number of individual houses dotted the hills through the early 90s, with a few more small condo buildings added, usually no more than 8 units each. Many roads were only dirt in the hills and development there was precluded. In the late 90s, development of the Amapas hill went into high gear. The first luxury condo building called La Cima was built on Calle Hortensias (Hortensias means “Hydrangea” in English), the success of which spawned a number of other mega projects. These larger projects, with at least 25 condos each were built from 1998 to 2008 such as La Cima 3, Horizons, Paramount Bay and others which define the area. 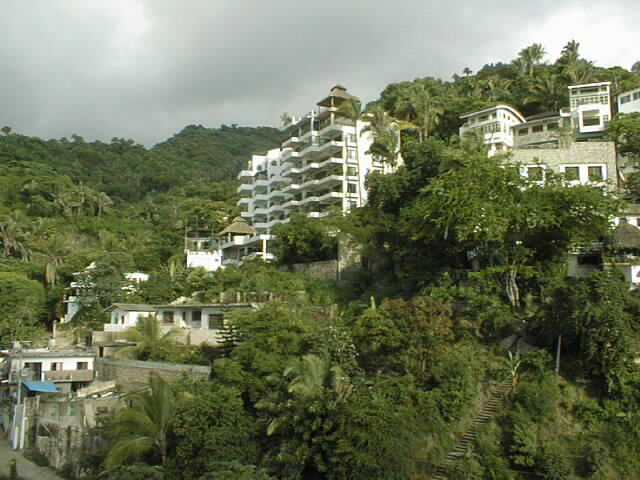 Sales of condos of more than a half million US Dollars in the Amapas Hills became common, making Amapas the richest area for real estate development south of Puerto Vallarta. Calle Gardenias was cut into the mountains opening up more land for development including Avalon and Los Moradas. Hortensias was connected through to its northern portion via a bridge over the Arroyo Amapas at Condo Selva Mar. On the north side, the large Villa Las Colinas projects were begun high in the hills. During the great recession, most real estate development projects slowed or stopped. Some giant projects including Amapas I and II, which neighbors opposed due their scale, perished in the recession and sadly sit now as empty reminders of better times. Since 2008 with the construction of Pinnacle which was originally proposed for 13 stories, the ANA worked with the city to develop a “Plan Parcial” or urban zoning guide, which was passed in 2012 to restrict development scale and height. It may generally be said that while developers want to press the limits of possible height and density, often past legal guidelines, current residents want the scale and character of the neighborhood to keep from becoming, as is often said “like Acapulco”, meaning a line up of towers without regard to green spaces, open views or the quaint infrastructure. The question of whether Amapas retains its beauty and livability, which drew many to its hills as a unique “Paradise” rests with how it is developed in the next decades. The ANA hopes to encourage this in the most positive way.